“I don't want to talk too much about it because I don't want to affect the way that fans get to see these films,” he said. “When we were kids, these movies came to us from far away. They were a gift. And the more we talk about how they're made, the more it reveals that they're just movies. But they're not just movies, they're more than that. Beyond that, I got the opportunity to tell a story that is a celebration of everything I believe in, I got to tell it to George Lucas and I got to tell it to Luke Skywalker, and those are experiences I will cherish for the rest of my life." Interestingly he divulged the story outline for Episode IX to Mark Hamill and George Lucas. Didn't Mark say something about liking Colin's vision, or am I just imagining that? No you're not imagining it. He did. "The changes in the directors have been hard for me because I admire Phil so much. I admire Chris so much. I admire Colin, and their body of work. But again, it's got to be really difficult to come to a meeting of minds on something this massive. I had discussions with Colin. I was very excited because we were on the same page in terms of where we wanted to go and how we wanted to see Luke in a way that we never seen him. Even in this current version. But I don't know what went on. I don't want to know because there is no upside to that story. I like all those people. I like Kathy, and I like Lawrence Kasdan and all the people involve in that decision, but sometimes ignorance is bliss. And they don't tell me anything [laughs]." Sorry, I’m getting all confused by the timeline here. So Trevorrow wrote the script for Episode IX with Luke in it somewhere between 2015 and 2017, right? But TLJ had it’s script ready before TFA got released in the theaters, which is 2015. But Trevorrow wrote parts for Luke? Am I misunderstanding it? Does Hamill’s “...Even in this current version.” quote refer to dead Luke? Maybe Trevorrow wrote parts for force ghost Luke? It's rumoured that one of the things that Colin was trying to get changed from the get-go was Luke's death. I'm not sure how reliable that is though, because it seems like too huge of a bone of contention to start off with. It's also possible that he had a huge role for Luke planned post-death (as a force ghost) kind of like Gandalf I guess. No wonder Hamill was excited about Trevorrow’s script. The Hero of Virtue comes back and saves the day as opposed to, you know, dead. And I'm pretty sure that you're correct in that someone said something (don't recall if it was Colin or Mark himself) about liking Colin's vision for IX. So, um, yeah... Colin was either going to resurrect Luke or we were going to get some sort of ridiculous, all-powerful Luke Force Ghost from Colin. It's so like the old EU. I do wonder why they let him try so many times over so long a time frame. Then again, L&M managed to get through filming most of Solo before they were fired. He sounds so... passive aggressive. Maybe that's just me. But I too am starting to believe the rumors that he wanted Luke's death retconned, or he wanted to give force ghost Luke a plotline of his own that was going to take focus from the new characters. It sounds like IX was going to be a Luke fest... which no thank you. I like the character, but I feel like he had his moment in TLJ and it's time to let the new characters shine, particularly the co-protagonists of the ST. I also didn't want CT anywhere near Kylo and the female characters. Colin Trevorrow lost me as a competent storyteller (and possibly as a relatable human being) when he said in some Book of Henry interview, without a hint of irony, that he wanted to show that Henry had "emotional intelligence, not BOOK intelligence." Those who have seen the movie, or even just snippets of the movie will understand why that comment is perplexing and kind of borderline terrifying. @rawpowah wrote: He sounds so... passive aggressive. Maybe that's just me. But I too am starting to believe the rumors that he wanted Luke's death retconned, or he wanted to give force ghost Luke a plotline of his own that was going to take focus from the new characters. Yeah, totally agree! Especially the bolded! I saw a trailer for Jurassic World before Solo- and yeah, I shouldn't judge a movie before seeing it (not planning to see this, but anyway), but from what I saw in that trailer I'm SO glad he is out! Yeah, he's basically all "Yeah, I got George Lucas's and Mark Hamill's approval, so I'm the real legit one!" I particularly "loved" how he made absolutely no mention of Daisy or Adam, when they *are* the ST. If rumors are to be believed, Colin told Daisy about his envisioned ending for Rey at an SNL wrap party or whatever it was....and she wound up in tears when he told her (who knows if those were "happy" or "sad" tears). I think that anecdote is very telling though, compared to whatever he told Mark and Carrie. And while Adam was supposedly told his character's arc before signing on.... This also would fit with the rumor of Colin struggling to write a decent arc for Ben Solo. Remember all those quotes of Rian and JJ gushing over each other's movies and scripts, about how they worked together to make the transition from TFA to TLJ seamless, how they were totally on the same page? None of that happened here with Rian and Colin. 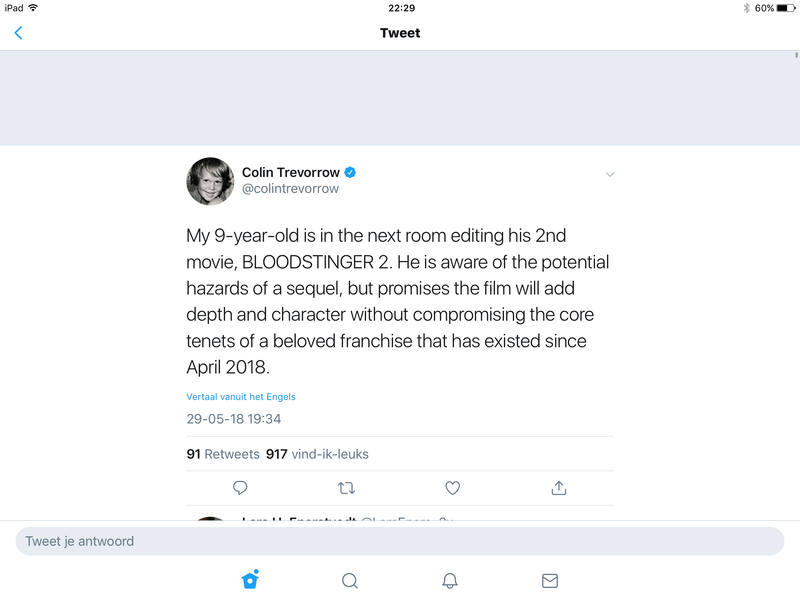 I struggle to think of a single thing Rian said about Colin's script or ideas, nor vice versa. Creative differences indeed. Daisy said she cried when CT pulled her aside and told her the plot...of course, she cried when she read TLJ script too. I guess that doesn't matter so much. I'm glad that he's moved along as well. Idk if it's a coincidence but basically every quote from CT about IX I've seen was about Luke or Leia or just something OT related.Only one I saw about Rey was about her parentage where he vaguely made it sound like he'll reveal it or something.Never saw anything about Kylo from him at all. I definitely wouldn't want some Luke heavy movie.We got that with TLJ,that really should be the biggest role he'll get in the ST considering his hero journey is done. Oh he sounds very passive aggressive and wouldn’t be surprised if he’s bitter over the whole experience. To use a sports metaphor he was the promising rookie who got elevated way too far and way too fast and then choked. And by choked I don’t mean that JW didn’t make a ridiculous amount of money. More that there was plenty of evidence from JW and BoH that he couldn’t handle something that was character driven and which has a woman as the central protagonist. His persona in press interviews versus RJ has been very prickly and didn’t really give hope that he’d handle situations with the same diplomacy and grace RJ has. I am glad Colin Trevorrow was replaced, even if I do have misgivings about JJ coming back. But with Kathleen Kennedy’s husband Frank Marshall producing the Jurassic World trilogy, of which Trevorrow is a big part, he is still one of the family, so to speak. I can’t see him saying anything truly bad or damaging when he’s directing JW3 as a consolation prize. It’s not Star Wars but if Fallen Kingdom does well, he might inwardly be breathing a sigh of relief about not having the weight of Ep IX and all that goes with it on his shoulders. This can be read different ways right? Is it about SW, JW? I'm thinking it's about SW. He's saying it in a way that it's hard to decipher for me. That was probably his intention.